Watch for a dark-colored discharge. Ear mite symptoms can cause extreme discomfort for your cat. Learn how to tell the difference between a case of mites and a yeast infection of the ear canal so you can get your cat some relief right away. Ear mites are tiny parasites that enjoy warm moist environments. The ear canal of your cat makes an ideal feeding and breeding ground. Ear mites consume earwax and irritate the ear lining. This incessant irritation leads the body to secrete a serum in response. The deeper the irritation, the more the skin lining will be attacked. This can lead to full on bleeding. 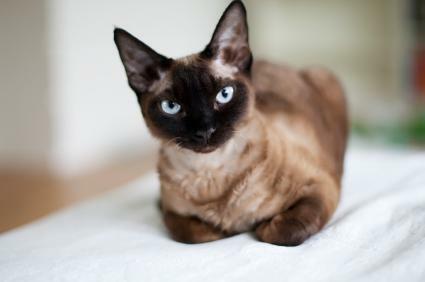 A cat with a dark-colored discharge coating the ear canal should always be suspect for an infection. It is also important for pet owners to be on the alert for ear mites if their cat is an outdoor cat or is often exposed to other pets. Although cat ear mites will not affect humans, they are rapidly spread by or to other animals such as dogs and rabbits. Moreover, ear mites are very easily spread. Even a mere second of contact is all one of these tiny crab-like creatures requires to leap onto your pet and trigger the countdown to an infection. Cat ear mite symptoms can closely mimic ear infections of differing causes, so there are only a few tell-tale mite symptoms that distinguish this type of infection from another. A cat suffering from an ear mite infection will usually have a black or very dark discharge within its ear canal that may proceed toward the outer ear. This discharge, due to parasite by-products and the actual infection process, may have an unpleasant odor. Since an ear infection is painful or irritating, your cat may scratch its ears a lot. A cat will often lay its ears back against its head or roll around on the floor and rub its ears against the carpet in order to relieve the itching or pain. Cats who experience pain of such severity will often howl miserably. As the infection progresses and the blood serum coagulates with your cat's earwax, this formulation may actually fill up your cats ear canal and form a blockage. In such cases, your cat will lose hearing in the affected ears. If you look closely into the ears of a mite-infected cat, you may be able to see tiny white creatures against the black background of the discharge. You can try using a magnifying glass and a light to see if any mites are present, but it may still be difficult to see them. Many cats will protest such an examination, and this is why a vet visit is typically required. Ear mites will not go away on their own. A visit to the veterinarian should be seen as essential in order to determine the cause and level of infection. In some cases, ear mites may travel to different parts of your cat's body which can make treatment even more complicated. This is because many ear mite treatments are isolated to the ear area, and since mites spread rapidly, your cat will be at risk for re-infection. Cat ear mite symptoms will go away with treatment, but it is important for pet owners to remember that this is a highly pet-communicable syndrome. When one cat is treated for ear mites, any other pets residing in the household must also be treated. This includes hamsters, rabbits, ferrets, gerbils, mice and dogs. Your veterinarian will inform you of the details involved, but a cat owner should be diligent during his cat's treatment time and understand that re-infection will be a highly inconvenient scenario if caution isn't exercised.